Naturally the format should follow its role model. Thus the game will be designed in three DIN A5 sized rulebooks (as that format is nicely supported by Lulu for the print edition I am going to produce). 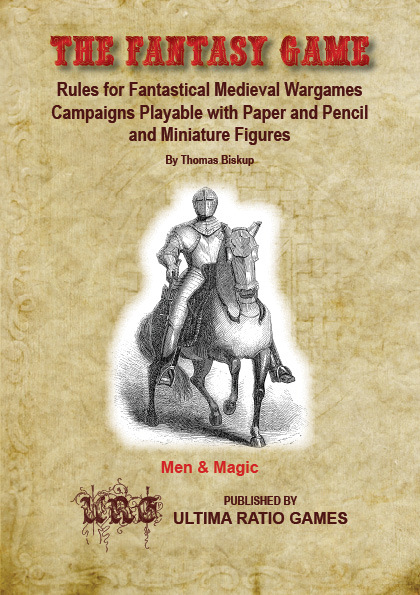 I will only use both the little brown books from the white box to create 'The Fantasy Game' and Chainmail (as both are required according to the preface in the LBB). The only sources used to extends and modify the given rules will be the collected house rules of Gary Gygax for OD&D as collected by Robert Fisher and Cyclopeatron. Philotomy's OD&D musings will serve for further inspiration although my goal is to stay as close as possible to the official rules. For image sources I only will use historical images (taken from Dover Publications and their excellent resource CDs). Cross posted this on the ODD74 forum but wasn't sure if you check the board much. This should be an exciting project for you and I'm sure we will enjoy reading it, so forst of all Have fun! I'd point out two things that may not have caught your attention. The first is that Gygax was one of two authors of the LBB's, and the other author - Dave Arneson - also had a house rule or two - a few of which he posted on ODD74 - the only community he felt comfortable posting on. Some of Gygax's "house rules" as Rob Kuntz, has pointed out, were basically rules found in Greyhawk. The second is that Gygax obviously disliked and discredited the rumor that the OD&D draft was ever called "the fantasy game". FWIW I know that Arnesons unpublished draft had an entirely different title (unique to him I think), which I'm not at liberty to reveal except to say it did include the word dragon in the title. FYI - I also know that Arneson "furnished" a lot more rules than what Gygax' implies in the interview, and that Gary's page counts are no where near correct for 8 1/2 by 11 (around 90), but its quite interesting to read his brief comments. If you are interested in knowing more about some of Arneson's contributions to the text http://dragonsfoot.org/forums/viewtopic.php?f=15&t=40440 and lots of stuff in the Blackmoor subforum on ODD74. Nice cover. Evokes the white box feel well.